Remove the lardons from the ready prepared lentils. Place the lentils in a pan with 3/4 litre of water and bring to the boil. Then simmer for approximately 15mn. Meanwhile, fry the lardons for 3 mn in a non-stick pan and without any added fat. Place them aside on a piece of absorbent paper. 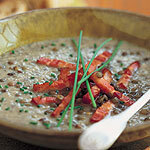 Mix the lentils, season to taste and serve very hot with chives and lardons. Brown the morel mushrooms in a pan with the butter and shallots for 7mn. 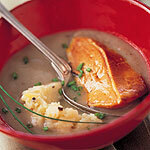 Add the mashed potatoes with truffle, 75cl of boiling water and the chicken cube. Simmer for 5 mn with the lid. Meanwhile, fry the duck scallops for 1½ mn on each side. Keep warm. Pour two tablespoons of duck scallop fat in the soup and mix well. Pour in four soup plates and place the scallops in the centre of each plate and serve immediately. 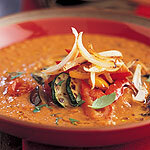 Place 500g of ratatouille in a pan with 1/2 liter of water, bring to the boil and simmer for 15 mn. Meanwhile, saut 200g of ratatouille for 5mn. Cut the larger pieces into smaller ones. Put aside. 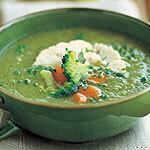 Mix the soup and serve with basil and the pan-fried vegetable. Microwave the vegetables in their container for four-and-half minutes. Add 20 ml of hot water, mix and add salt and pepper to taste. Serve with the salad herbs sprinkled on top.